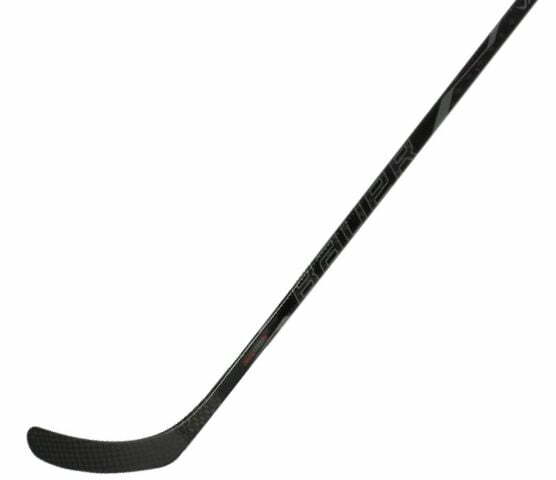 Bauer Vapor XShift Senior Hockey Stick | Sports Etc. The Bauer X Shift sticks are a Source for Sports exclusive model based on the Bauer European Team stick with added performance upgrades and a unique graphic. Offered in only senior models, the X Shift layers on performance with upgraded shaft and blade constructions. The shaft of the stick features the core from the Vapor X800 stick and has an outer wrap made up of basket weave carbon composite to improve the feel and durability. The shaft also features micro feel II dimension for a better feel on the hands and has an upgraded tac spiral grip for the ultimate in control. Moving down to the blade of the stick, an aero foam III core provides a soft feel when handling the puck and dampens vibrations felt when receiving passes or shooting. This core is wrapped fully in an upgraded 12K carbon composite and features a pure shot blade profile to allow for a more accurate shot every time. The Vapor X Shift also has dual flex points allowing the stick to flex in one of two places depending on where your hands are placed for maximum loading and a quick release. To aid in the process, Bauer utilizes their QRT Technology taper system. QRT Technology is a much more aggressive taper design that is optimized to load and recoil energy in the lower part of the shaft allowing a player to get their shot off faster than ever. Looking for elite performance at a fraction of the price? The X Shift has you covered. Source for Sports exclusive upgrades include a tac spiral grip application, full 12k carbon blade with an aero foam III core, a X800 shaft core with a basket weave outer wrap and a filthy black and red graphic.